Mid summer’s late evening light and July’s caddis hatches created the seasons first after hour’s Shop Rats night out at a local watering hole. 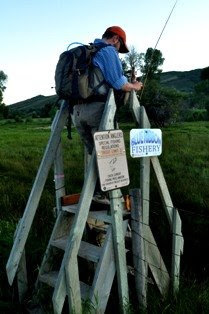 After a long hot day of trolling behind the counter the thought of cool air and water is sufficient motivation alone to expeditiously flip the closed sign and head for the nearest productive water. Add some cold brews, a chew, the potential for an evening rise with your compadres, and closing time just can’t arrive too soon. Prior to our hasty departure discussions as to choice of waters given we have several good fisheries within an hour of the shop occupied the quite times. Matt, a shop manager and one never of a mind to waste coveted fishing time settled the conversation; what’s the closest river that allows us the most amount of time on the water to fish? With that pragmatic approach we settled on the Weber River. The fact that this river also has some of the states most prolific evening caddis hatches and a fair number of sizeable browns only bolstered the beleaguered resolution. In the end it mattered little, yet generated much more than an idle thought. We arrived from a variety of directions. Nick and Bryce rendezvoused at the Side Track Café, a favorite shop eatery in Heber City, for Pasta Night and a few cold ones before joining those of us who worked. Sometime around 11pm when we’d reeled in for the night their diversion proved a wise diversion. Shortly after our arrival and rapid exodus from Matt’s Element, the local residents quickly amassed for a gathering in hopes of a quick easy meal. Several dove for the Deet when one paused long enough to intravenously take a blood sample before joining their mates. 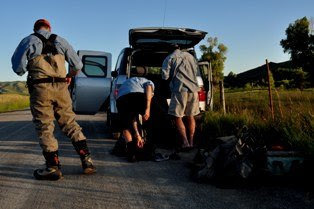 Bodies and gear were quickly sprawled about the ground in preparation for the evening hatch. Momentary confusion struck before the cluster of Patagonia Pack Vests were personally identified, given that’s what most of us fish with. If there was ever such a thing as chaotic organization, we resembled that conception. From a distance to the unsuspecting observer we may have more closely resembled a well armored swat team versus anglers preparing for an evening on the water. Like ants we anxiously followed each other across the lush field to the rivers edge. From there we broke off into various directions in search of caddis and a seductive rise. By now suns heat had settled below the western horizon, the air now chilled. The tall streamside grasses yielded a few caddis as we moved about. Several worked their way over the waters mirrored surface, yet no trout rose to take the fleeting insects. From the tailout, the footprint of a subtle rise grabbed the evening’s first attention. Shortly after that another rise appeared, the ring quickly melting with the ruffled surface of the riffle. Eventually several browns broke the waters rippled surface as caddis began to rise. A quick flip of a fly into the seam where several trout had risen didn’t drift long before dissappearing in the dying light. 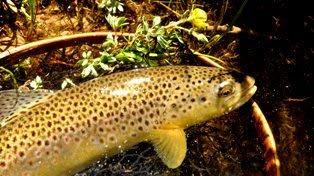 It wasn’t the largest of browns, yet its strength left an impression of a trout much larger. We hooked into several more spunky trout before the trout and the brief hatch ended among the growing darkness. Succumbing to the inevitable we made our way under a star filled sky back. Several headlamps disappeared in and out of the dense vegetation, highlighting the others. On the frontage road, the dome lights from a vehicle showed others had given up earlier. They greeted our arrival with a welcome and cold beer. This will be one of several such forays now that the caddis have begun to pop. We talked of the fortunes we have here in Utah and the west before departing. Although such forays surrender moments of pandemonium, these evenings always make for a rejuvenating conclusions to a long day. This evenings experience was no exceptions. Great pics and post. I love fishing summer nights.